Whether you believe there is a Canadian housing bubble or not, consider the following two facts: Canadian household debt is at an all time high and home prices are still rising. If this doesn't scare you then read on. Record high indebtedness means that we are as vulnerable as ever before. When things turn south, a Canadian consumer with debt to income ratio of 165% would be much more sensitive to economical shocks compared to a consumer with 110% ratio. Our indebtedness is an accident waiting to happen. 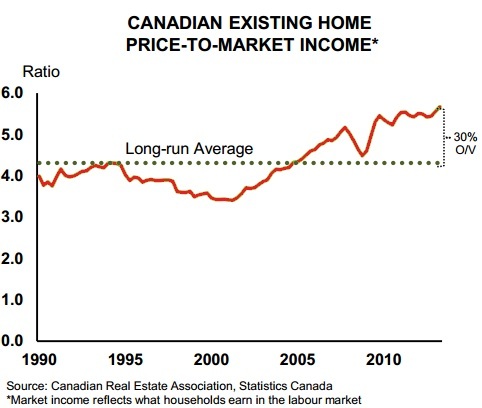 Additionally, consider the possibility fact that higher home prices are actually hurting Canada in the long run due to reduced competitiveness. When home prices in Toronto are double those in Philadelphia it means that T.O. workers will demand higher wages which reduces competitiveness. Simply speaking higher home prices equals reduced number of jobs. And, by the way, this is not my original opinion. It's the opinion of the CEO of TD Bank Ed Clark. If you are still not worried about the Canadian housing market then I suggest you consider the following 7 points. The following list is based on a YouTube video by Patrick Doyle which you can view below. I've summarized his main points and added all the graphs. Enjoy! 1. The more you pay the lower your subsequent returns. During the past decade home prices in Canada grew at about 7% per year. 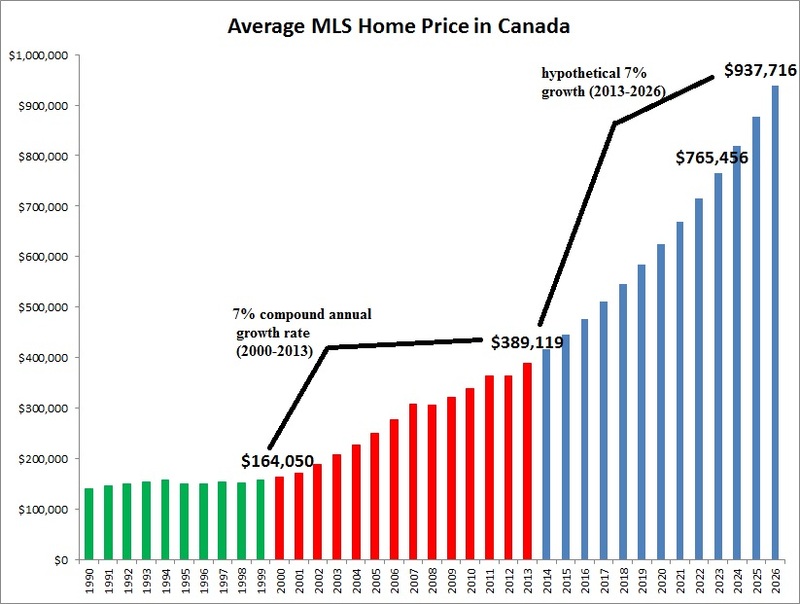 Now if you think that this trend will continue into the future than the following graph would mean that the average home price in Canada would be over $900,000 in 2026. Sorry to disappoint, but that ain't going to happen. If you are extrapolating past real estate price growth into the future then you may as well extrapolate income growth. Since Canadian wages have stagnated, chances are that they will continue to do so in the future. This leads us to point #2. 2. House prices are unsustainably high given incomes. Various financial entities estimate that property prices in Canada are overvalued by about 30% against incomes. Of course that number varies from city to city. 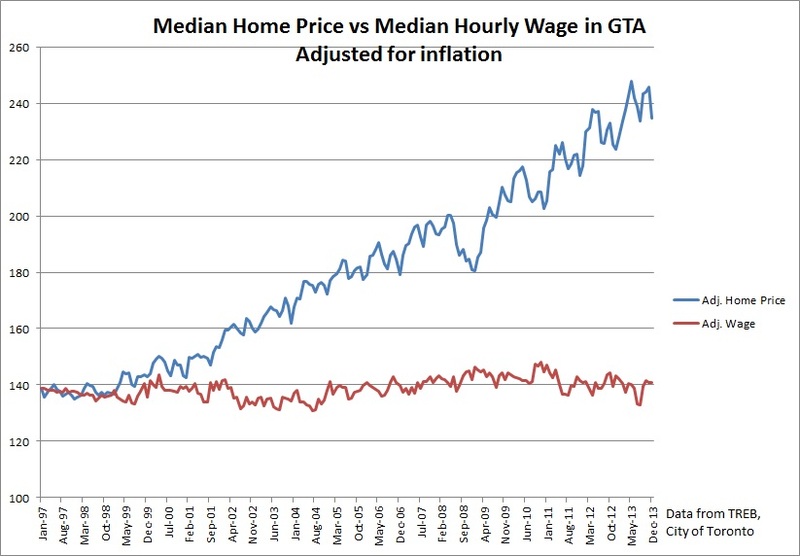 I suspect that in Toronto homes are much more overvalued against incomes. 3. Over time, real estate can't outstrip economic growth. 4. Canadian debt loads are at record high levels. 5. It's cheaper to rent. Currently you can rent this 620 sq.ft. condo in downtown Toronto for $1,695 per month. You can buy this exact same unit for $449,500. The monthly carrying cost of buying based on a 5% down payment would be $2,643 not including CMHC insurance. Mortgage at 3% = $2,026, maintenance $338, property taxes, $279. Now some say that principal repayment should be included in calculation but I disagree. Firstly it doesn't make it any easier to afford on a monthly basis. Secondly, subtracting principal repayment from monthly carrying costs is both flawed and dangerous. It is flawed because it inherently assumes that property prices will indefinitely rise into the future. Yet the reality of real estate is that roughly half of the time real prices go up and the other half of the time prices go down. See chart. With a possible 20% to 40% price correction in Toronto's condo market, owners equity can be wiped out in a blink of an eye. Leverage works both ways. It can make you rich or it can make you homeless! Going back to point #1, if past = future, then the above 620 sq.ft. condo worth $450,000 now, would cost $946,762 in ten years. But don't worry - that ain't going to happen! 6. You can't trust economists. Don't trust the cheerleaders who work for the bank. Not only they are biased (selling mortgages etc.) but they are also misinforming you. They say that home prices are affordable now due to low interest rates but here's the thing. 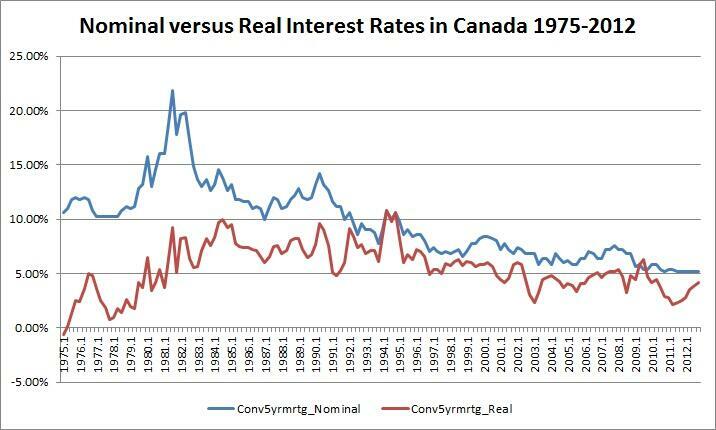 As history suggests - interest rates change over time. So just because you can afford a mortgage payment today doesn't mean that you would be able to afford it tomorrow. Real estate is a long term shot and through out the years you would go through different interest rates regimes. You've been warned. 7. The Risk-Reward isn't there! 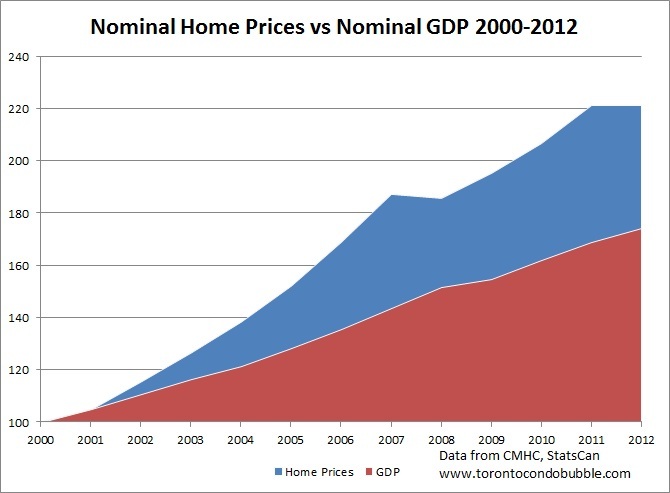 If you have a chunk of money to invest it would be foolish to put it into real estate - let's say in Toronto. It would be stupid to invest into Toronto's real estate, when it's overvalued on every single metric in the world, expecting that in 15 to 20 years Toronto would become a world class city like New York. The risk-reward simply ain't there. Still thinking about investing into Canadian real estate? Tell me why below.